September 12, 2014 — HOLYCROWITSTHEHALLOWEENSEASONAGAIN. So exciting. It’s that time of year where we take our people masks off to show off our monster faces, that time of year where even the most glass-and-metal urbanite becomes suddenly super-interested in agrarian activities, that time of year when candy becomes an officially sanctioned part of a complete diet. Halloween. Fall. Autumn. Samhain. Sweater season. You know the deal. Maybe. I celebrate Halloween and Fall for a month and a half, a Halloween Season. I blog about it every day, documenting our activities and trips, discussing things we find on store shelves and in the recesses of our own home, screencapping the horror movies and TV we watch...anything that’s spooky or harvest-y. You can peruse the Halloween Season blogs from previous years for a much clearer depiction of how we do this season, and I definitely recommend it. Lotta good memories there and lotta ideas for taking the most advantage of this time of year. This season, I’m opening with a video. A video I filmed at midnight, by myself, comfortably inebriated, in the spooky attic of my barn…the same barn where we had our Barn Attic Amphitheater night and that other time that we invoked The Ghost of Ray Bradbury. It boasts quite a few bad edits, but I think it’s a good enough starting pistol. We do Halloween long-time. Starts today. I’ll be writing daily articles on spooky oddities, road trips, candy, movies, activities, and all the weird stuff that only this strange season could make possible. I’ve got a book coming out. About Edgar Allan Poe. On October 6. We’ll talk about it then. A lot. 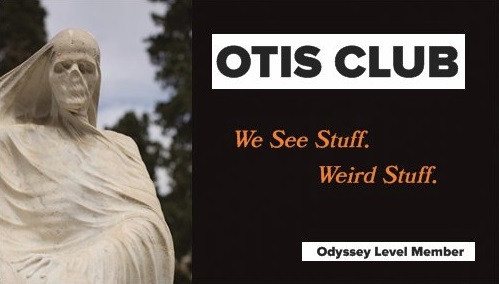 Meanwhile, if the OTIS website isn’t enough, I’ll be all over the OTIS socials: Facebook, Instagram, Twitter, Tumblr. Wherever you’re most comfortable sharing the private details of your life, I’m probably there, too, sharing too much of mine, although right now those details are gloriously orange and black and all spikey with corn stalks. Happy Halloween…every day until October 31.